The Busbar Bending, Cutting & Punching Machine EM BU 40 machine is technologically advanced, compact & versatile machine. 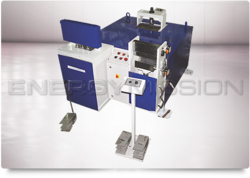 Busbar Cutting Machine: It is designed with the fact of reducing the efforts to cut busbar with 0 % Wastage. Cutting time for 12mm thick busbar is 10seconds. Size: 200 x 15 mm. Punching dies : 3/8" , 1/2" , 5/8" , 3/4"
The Busbar Bending, Cutting Punching Machine EM BU 40 machine is technologically advanced, compact versatile machine. The Machine is designed to cater the requirement of bus bar preparation almost all operation are included in one machine. This is a highly productive machine suiting to growing demand of industries. Energy Mission Machineries India Pvt. Ltd. 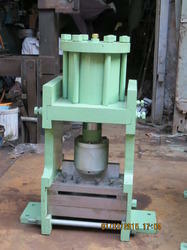 Hydraulic Busbar Cutting Machine is used for cutting flats of different sizes. Hydraulic Busbar Cutting Machine varies in different tonnage capacity. - Usage: Electrical industry, automobile industry, etc. In order to cater the diversified demands of our clients, we have been able to provide a unique range of Hydraulic Manual Busbar Cutting Machine. BUSBAR BENDING , CUTTING AND PUNCHING IN SINGLE MACHINE EASY TO OPERATE HELPS TO DO THE JOB FASTER AND SAFE. SP 200 & SP210. Make : Waves Electronics Pvt. Ltd. Bus Bar Cutting : 20 X 6 to 100 X 10 Max. Bus Bar Hole Punching : 5 mm, 6 mm, 7mm, 8mm, 8.5mm, 9mm, 10mm, 10.5 mm, 11 mm, 12mm and 13 mm Max.